Almost three years ago, I went to the very first Knit & Knot fibre fair. Schaap & Draak was one of the sellers. She is an indie dyer, and she sells both hand dyed fibre and yarn. 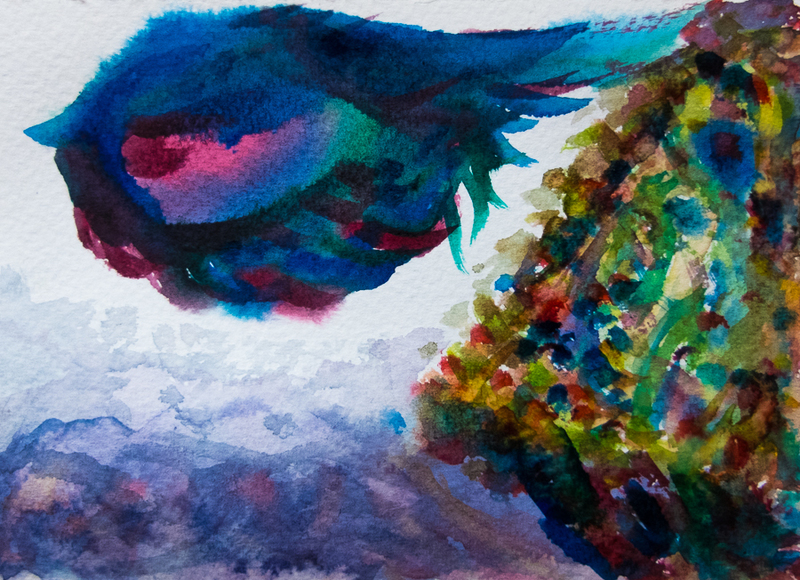 I fell in love with one of her colourways, a combination of blue, green and fuchsia. I didn’t buy it at that time, but I couldn’t get the colours out of my head. So I painted them. Schaap & Draak’s owner saw my painting and was inspired to name the colourway “Pauwvogel” (peacock bird) because of this. I felt honoured! 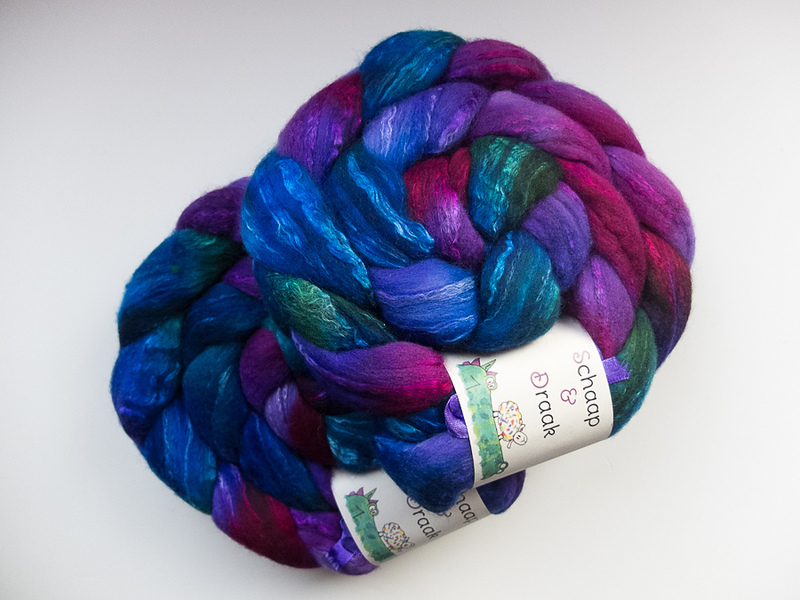 And it wasn’t long until I had ordered two lovely braids of Pauwvogel, on merino and silk. Last year, I spun the fibre into yarn. I made a chain plied sport weight out of it. I had no project in mind yet, but I knew it had to be special. And last month, I decided that it was finally time to make something with it. 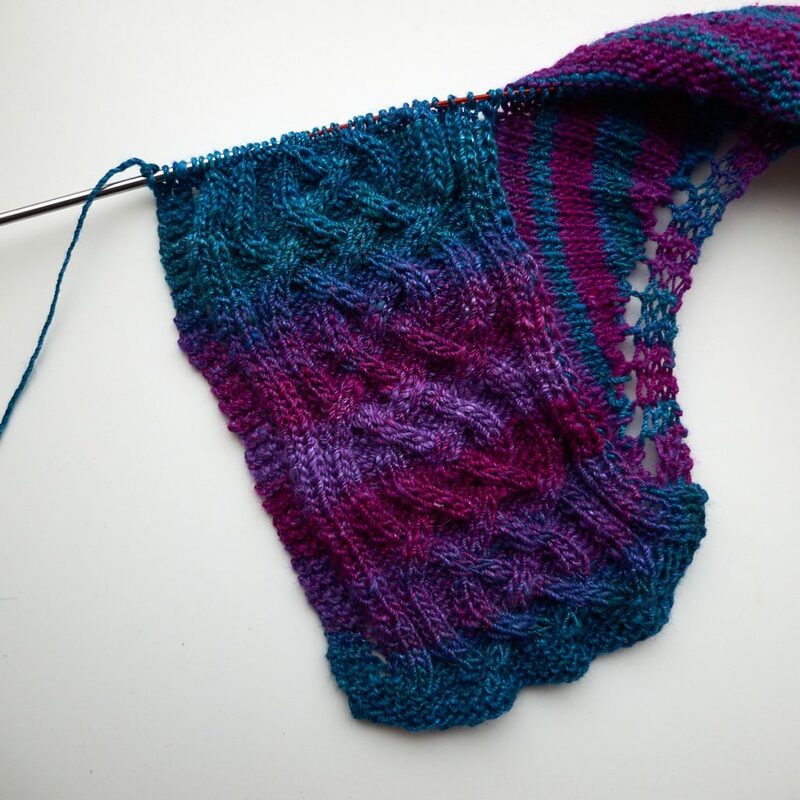 I looked at patterns in the Ravelry database, and in the end I decided on Celtic Myths by Asita Krebs. It’s a free pattern, and I thought it would work well with the Pauwvogel yarn. When I spun it, I took care to not make the colour changes too abrupt, so it should work with a pattern that has long rows. I cast on and started the body. I didn’t do the cast on from the pattern, because I had read some comments on other projects that it creates a bit of a hump at the centre of the neck. Instead, I opted for an improved cast on method that didn’t have that problem. Small beginnings. Look, no hump! It turned out that the colour repeats in my handspun matched the pattern quite well. They formed long, lengthwise stripes, so it didn’t look like clown barf or chaotic after all. I was relieved, because I didn’t remember exactly how long the colour repeats were. The pattern said that the border needed about 1.1-1.2 times as much yarn as the body. 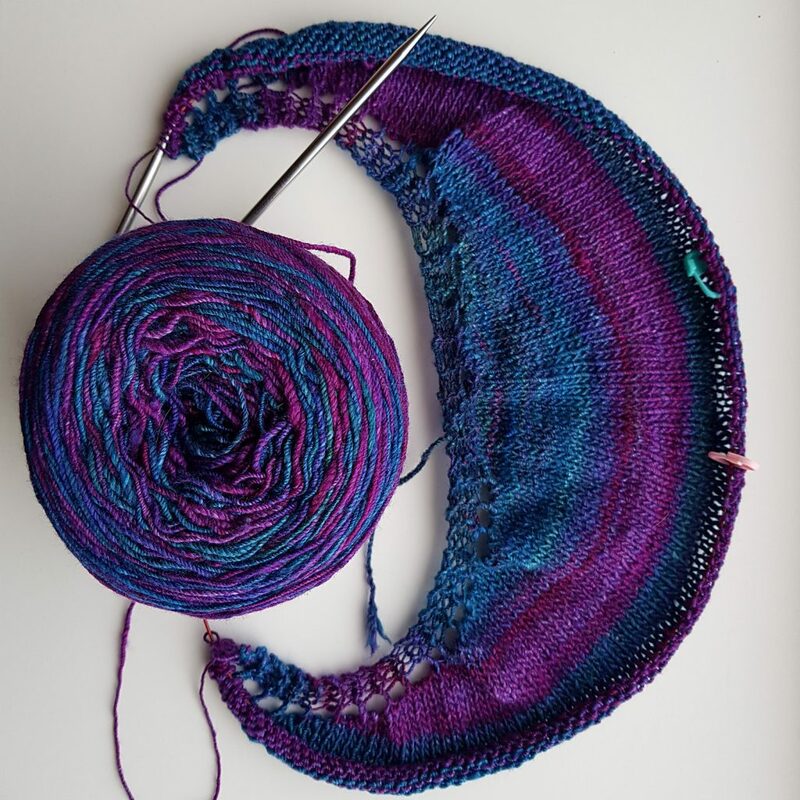 As I started with a bit over 200 grams, that meant that I could knit the body until I had 109 grams left. At that point, I had 309 stitches. That would mean that I had to knit 38 repeats of the border pattern. After knitting four repeats, I had already used up 19 grams of yarn, so I knew I would never make it. So, I tinked back to 261 stitches (135 grams left), and tried again. This time I also went down a needle size (from 4.5mm to 4mm). I didn’t like the tightness of the resulting fabric, so I frogged again and used my 4.5 mm needles instead. Much better. 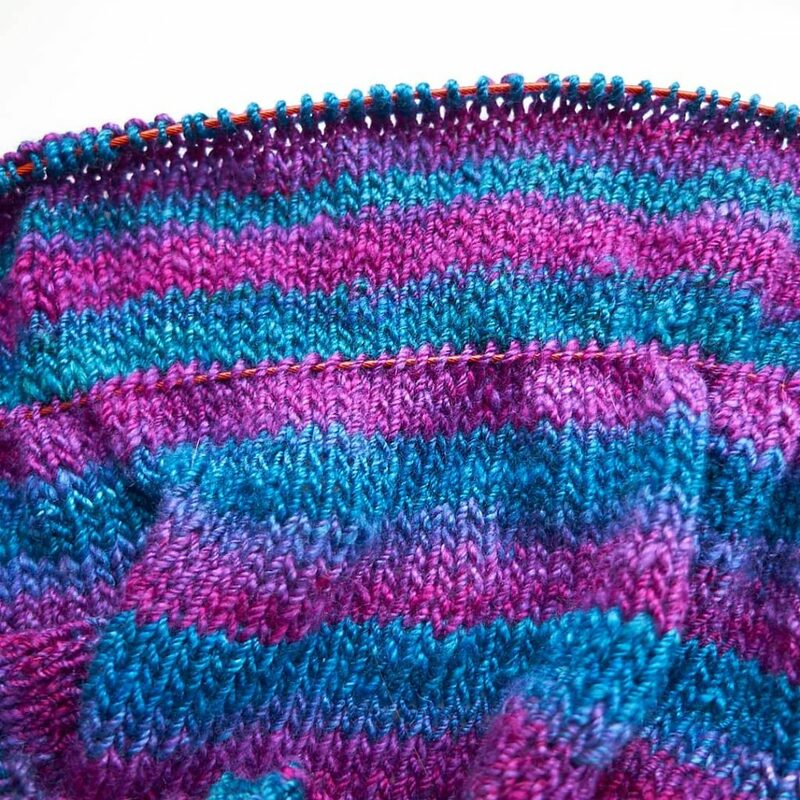 By the way, did you know that tinking is undoing what you just knitted? And if so, did you ever notice that tink is actually knit spelled backward? Clever, isn’t it? Anyway, I was well underway on the border, when I realised that again, I would not be able to finish the border with the yarn that I had left. I was getting quite frustrated at that point. But I pushed on and tinked back to 229 stitches (150 grams left). If that wasn’t enough for the border, I didn’t know what would do it. And fortunately, this time it went well! I did give myself a scare close to finishing, though. The border pattern consists of 16 rows. I had 27 stitches left to go at the end of a repeat. So I freaked out: would the border end in the middle of a repeat? Did I miscalculate the number of border stitches? But then I realised that the repeat may be 16 rows, but you only bind off one stitch per two rows. 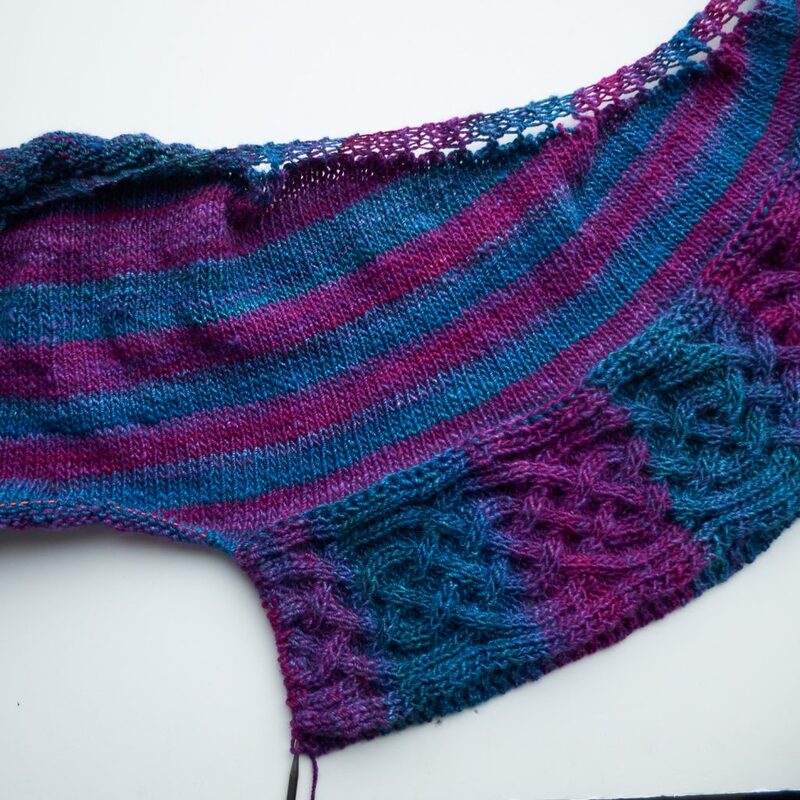 So with those 27 stitches, I still had three repeats to go, plus the side garter bit. Phew. Leave it up to me to fabricate problems when there are none! 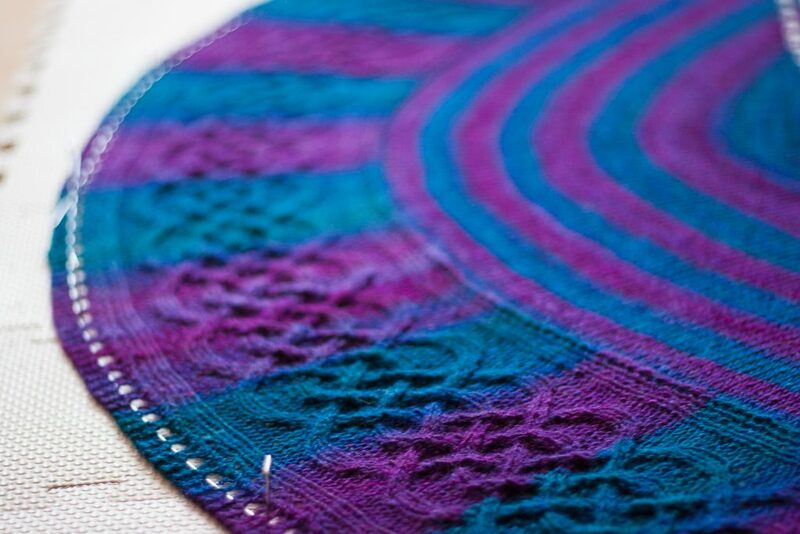 When the border was done, I gave the shawl a bath and put it on my blocking mat. It’s a perfect size, I think. I tend to make really large shawls that are awesome, but not always practical. This one is a bit shorter, but with enough body to keep me warm. 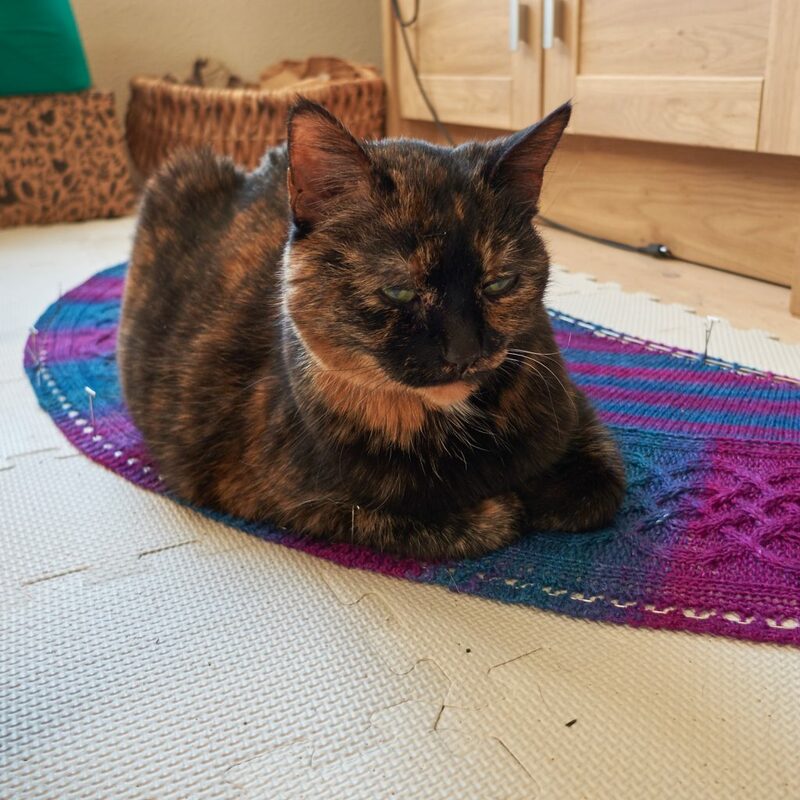 Of course, Freya became quite alert when I pinned down the shawl. 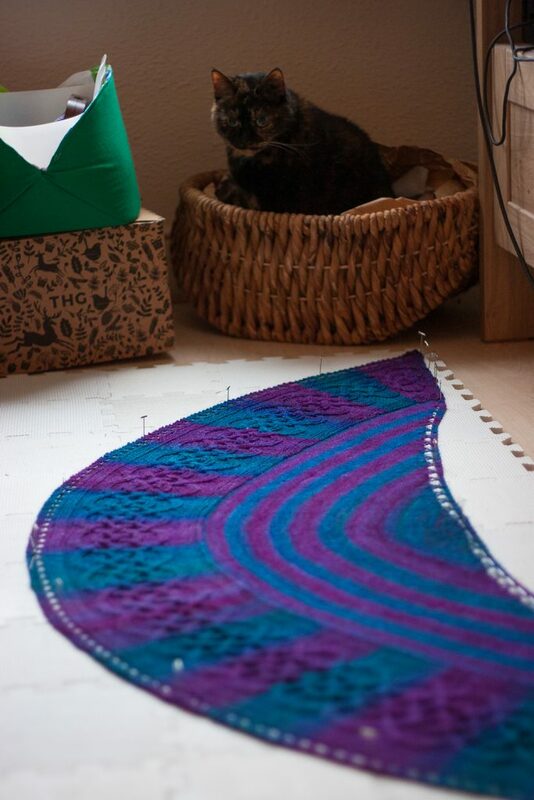 She sat next to me and batted at the blocking wires while I tried to put them into the shawl. But as long as the shawl was wet, she would not sit on it. It’s winter, after all. Today, she could finally do her part and she gave the shawl a good cat-pressing. Good old Freya. I’m very happy with this project, and it’s quite special to me. 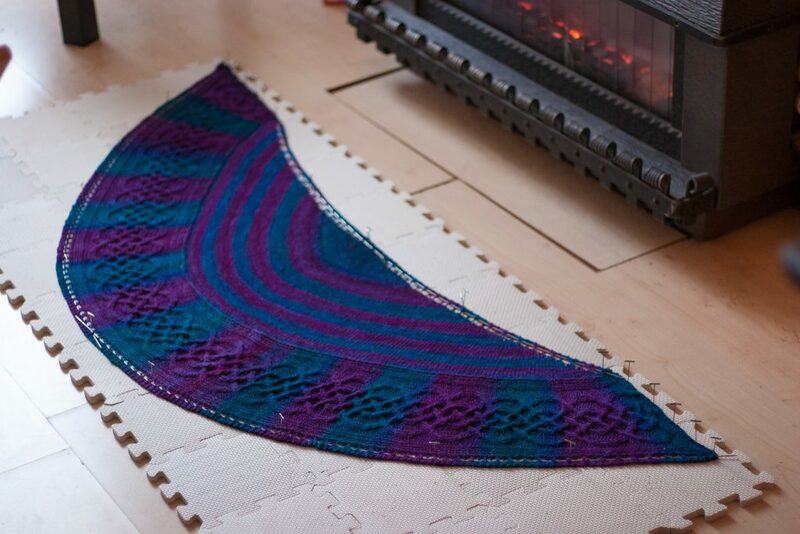 Knitting with handspun is always a joy, and this project was no exception.